A three night trip to one of our favorite sites - Castlerigg Hall, Keswick. No problems on the roads this time, so we arrived more or less when we wanted to and slotted into pre-allocated pitch no. 22. Great view from this pitch. It was warm enough to have lunch al-fresco and sit outside for a while, even for J! 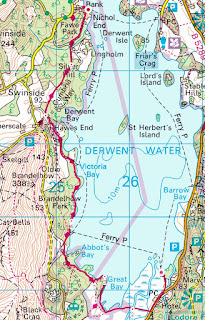 Then we walked down the hill into Keswick and had dinner in the Wainwright, which is our pub of choice in Keswick. We got a taxi back to the site. Not as sunny today, but it didn't rain until late afternoon when we were safely back in the caravan. 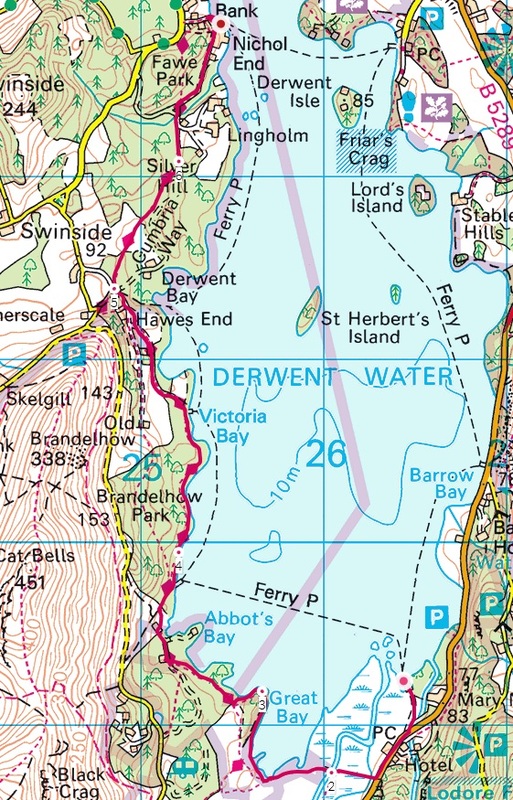 We drove to Derwent water and got a ferry to Lodore, then walked back along the shore to Nichol End, about 4 miles. Nice easy walking, D was saving himself for a more strenuous walk the next day. The plan was to get a ferry from Nichol End back to Keswick, but we had all day hop on hop off tickets so we got one going anti clockwise round the lake instead, which took about 45 minutes. We stopped off at Booths on the way back to the site to pick up some supplies for a quiet night in - cheese, beer, crisps etc. The weather improved later and we got to see a pretty good sunset from the site. Later we popped in to the nearby Heights Hotel Crag Bar, but it was almost empty and we only stayed for one drink. It's very dated and lacking in atmosphere (although the background music was nice and jazzy this time, a nice change from the usual classic rock), but it serves Loweswater Gold and we like the man who runs the hotel with just his wife helping, we think. A trip to Castlerigg Hall wouldn't be the same without going to the Crag Bar. 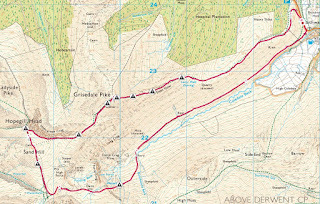 An early start for D, for a walk up Grisedale Pike (791 metres) and Hopegill Head (770 metres) from the village of Braithwaite. Two more Wainwrights ticked off. Just about perfect conditions for walking. although not many people about except runners and on the way down cyclists lugging their bikes up the hill. J stayed in the caravan and had a nice relaxing start to mother's day. Youngest daughter L is working in Tweedies hotel in Grasmere at the moment, and son A drove up for the day so that we could all have huge roast dinners in Tweedies. A insisted we stay for the Liverpool match, which they won courtesy of a last minute own goal to keep their title dreams alive, much to the delight of just about everybody in the bar. A dropped us off in Keswick before heading home, but we we didn't stay out long. Up and away early, we got home well before midday. Nothing booked but we might try and squeeze another trip in before Easter weekend, which seems to be fully booked everywhere. Our first "real" trip of the year, the last one was more of a fact finding mission to see how the new car would perform and whether the caravan had survived the winter. The caravan is fine and now that it has been fixed the car is growing on us. Our destination this weekend - the Windermere C&CC site. The aim was to get there at 1pm, the earliest arrival time, but signs saying that the M6 was closed soon put paid to that! Fortunately we managed to navigate around the closure using the A58 and then the M61 and we ended up getting there just after 1.30pm, so it could have been a lot worse. We got reasonable pitch, but forgot to take a pic of the caravan this time. 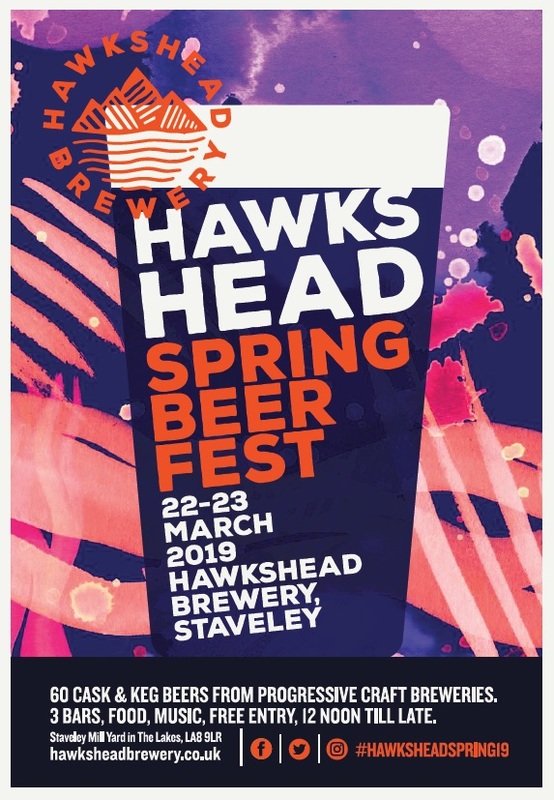 As soon as we had set everything up we headed across the fields in the rain to Staveley, for the Hawkshead Brewery Spring beer festival. Lot's of beers sampled, we stayed for about 6 hours! It was really busy in the afternoon but we managed to find a seat when we wanted one, and it seemed to quieten down a bit in the evening anyway. Better weather today. 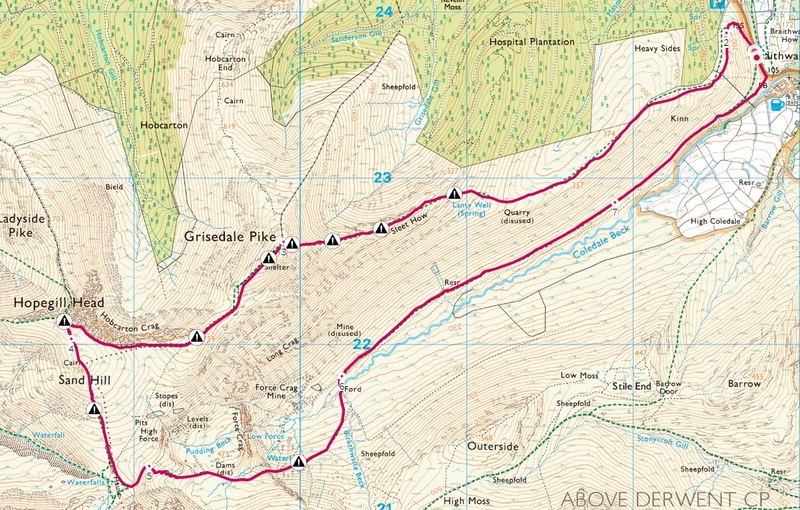 We went for a walk from the site along the Dales way to Windermere, about 6 miles in total. We got a train from Windermere back to Staveley and returned to the beer festival in the afternoon, but it was packed and we didn't stay long. We thought the Eagle and Child might be a bit quieter, and it was...a bit. We sat outside in the beer garden overlooking the river. The Eagle and Child is a nice pub but we only seem to come to this site when the beer festival is on these days, something we might remedy later in the year. Some friendly sheep who followed us for a while on the way back to the site. We got back to the site around 6pm and had dinner in the caravan and a night in. A fabulous sunset but by the time we noticed it it was too late to go up into the hills to get a pic, and the pic we took from the caravan was rubbish. One that got away! Up and away early, no problems getting home. A three night trip to Castlerigg Hall, Keswick. Our first trip since the end of November last year. 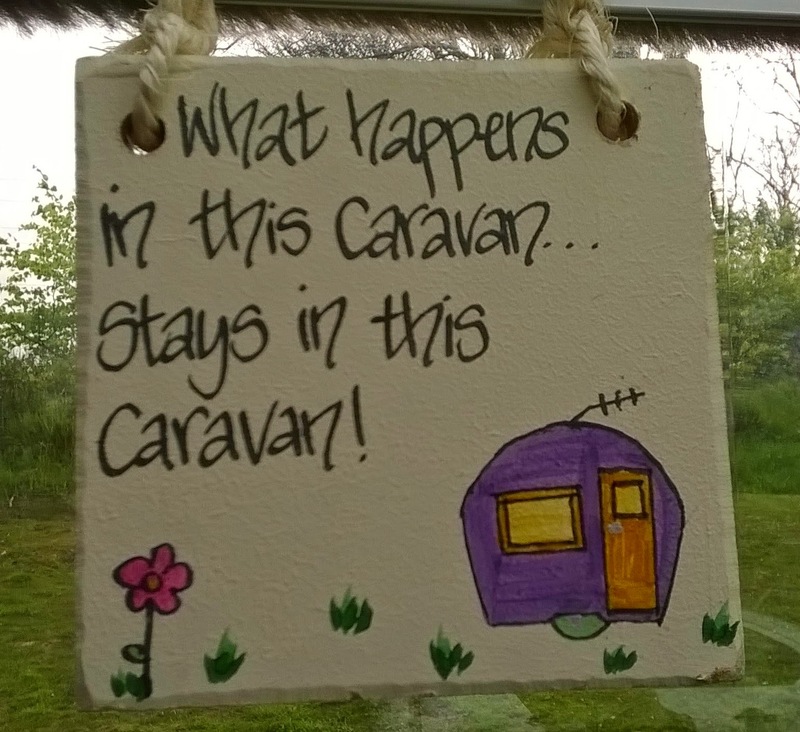 Not intentionally, we would like to be year round caravanners but circumstances got in our way this year. Maybe next year. We changed our car mid December. We really liked the Kia Sportage and we never had any problems with it, but the lease was up and it had to go. The new model Kia Sportage was too expensive, so we opted for a Nissan Qashqai instead. About the same weight, power and torque as the Kia, but so far nowhere near as reliable! Problem number one - a bit of trim around the passenger door doesn't quite match up. Poor quality control, well it is made in the UK! Not worth kicking up a fuss, we thought, and we've got used to it now. Problem number two - we couldn't get a towbar fitted. It's a new model so none of the towbar manufacturers currently make a towbar that fits it, something we found out when a mobile fitter turned up to fit one early in January. Instead we had to get one fitted by Nissan, which turned out to be much more expensive and meant a bit of a delay. Problem number three - a problem with the adblue system, which has just been fitted to the Qashqai and is supposed to reduce emissions. A few days after the first warning message appeared it just wouldn't start and had to be towed to our local Nissan dealer. It took over three weeks to fix, so we missed out on the nice spell of weather in February because the replacement car we got from Nissan didn't have a towbar. Good things about the Qashqai - it's very economical. That's about it. Hopefully all the problems are out of the way now...apart from an annoying clicking noise from the clutch pedal which we'll probably have to learn to live with. We had the same thing on a hated Vauxhall Insignia we had a few years ago. Anyway, that's enough moaning about cars. We wanted somewhere close to home to see how well it towed and to see if the caravan had survived the winter, so we chose the Southport CAMC site. Same destination as our last trip last year. Despite a smaller engine the Qashqai tows at least as well as the Sportage, and we arrived just after midday after a journey that only took about 30 minutes. All that was available was a non awning pitch, but we managed to get quite a good one. 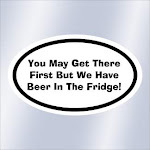 A sigh of relief when we found nothing wrong with the caravan after the winter break. We are thinking of moving to somewhere in the Southport area later this year, so we went for a drive to have a look at a couple of roads with houses for sale. We're not really in a position to move just yet, as we are in the process of sprucing our house up a bit to make it more saleable! Then we walked into Southport and looked around the shops and had some drinks in some of the pubs we like. Our favourite this trip was the Bottle Room. Only two beers on tap but lots of bottles and cans to choose from. Luckily D liked one of the beers on tap. We had a late dinner in the caravan and spent the rest of the night in. A very windy day, in the morning at least, but not much rain and plenty of blue sky. We went for a walk from the site along the beach towards Ainsdale. Just one pic this trip. In the afternoon we walked into town and had a walk on the pier. Last time we came to Southport the pier was closed for refurbishment, but it doesn't look like anything has changed, apart from the cafe at the end has had a bit of a makeover. We did a lot of walking today, about 35,000 steps in total! We had tapas in a Spanish/Turkish restaurant in the evening. http://www.bistrobarmed.com Very nice food, and generous portions - we were too stuffed for dessert! When we booked they told us we had to be out before the belly dancing started at 8pm, so we went to the Bottle Room for an after dinner drink. We had a look in the window on the way back to the site but there was no sign of belly dancers! Southport on a Saturday night is like Liverpool city centre on a quiet Sunday! We must be getting old, we like it that way. It was raining when we woke up and we got soaked packing everything away, but luckily we were home before the high winds and hail storms arrived! Windermere C&CC site, for the Hawkshead brewery spring beer festival, then Castlerigg Hall in Keswick.